This amazing discovery was found in South Dakota. Notice how millions and millions of years of erosion from water and wind has left the face of the cliff? 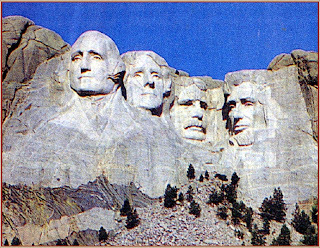 It appears to resemble the faces of George Washington, Thomas Jefferson, Theodore Roosevelt, and Abraham Lincoln. Why should you doubt that this is the product of time and erosion? If you don't accept the Design Argument for the existence of God; then you can't use that argument to justify that this strange rock formation is the product of an architect(s), artists, and construction crews - because you were not there to see the ostensible construction project with your own eyes. If you consider the complexity, of this strange rock formation and compare it to the complexity of the human eye, brain, every species of mammals, reptiles, fish, plant life and the solar system...then you will have to agree that the probability of this strange anomaly occurring by random chance, time, and erosion is extremely likely and was almost certainly the cause. In other words this is a "no brainer" the justification that time and erosion is responsible for this rock formation and when we consider evolution is almost as certain 2+2=4. Let’s digress for a moment and discuss probability. The chances against one cell evolving from non-life by itself through random chance are 1 in 10 to the 57,000th power. Do you know how large this number is? The number of electrons in the entire universe is 10 to the 40th power. Exponentially, 10 to the 41st power is ten time 10 to the 40th power, 10 to the 42nd power is 100 times 10 to the 40th power… The chances of life evolving from nothing are unimaginable. I believe the odds of every species of animal, and plant evolving from non-life is incalculable. So as we can see, the chances against Mt Rushmore being created by erosion and time are no where near as staggering as the theory of evolution; therefore, if you accept evolution, you shouldn’t find any trouble with the odds that Mt Rushmore is an anomaly of nature. By the way most would agree that the chances of an explosion taking place in a print shop and the end result being an unabridged dictionary are greater than life appearing from non-life by random chance. The best one could argue is that evolution is logically possible – but this is a vacuous truth. For example: It is logically possible that I take 5 minutes away from typing this article and fly to the moon, grab some moon dust, flap my wings and fly to the sun at light speed, and then return home for my cookies and milk at bedtime! Consistency and rationality would demand that if you believe that all of creation is the result of godless random chance and evolution, that you also believe this rock formation is also the product of random chance. Did you see anyone create this cliff-work or are you taking the mere testimony of a few people who themselves didn't see this being created or maybe a some photographs that claim to the the monument under construction? Well there is more testimony and empirical proof for the existence of God than there is for the construction of Mt. Rushmore. If you are grounding your knowledge of the origin of this rock formation in the testimony of a few school teachers; then what about the testimony of the hundreds of men, eye-witnesses, and miracles to the truth of God and His bible? If you criticize and deny the epistemology and reasoning that the Christians use to prove the existence of God and the truth of the bible; then you leave yourself in a place whereby you also deny yourself of any knowledge whatsoever...I hope that you beginning to see the foolishness of evolution and the stories about the universe occurring by random chance without a designer? We cannot ground any of our knowledge or reason or prove anything apart from God. The further away we get from the acknowledgement of God; the further we get from sound reason. Of logical necessity we become forced to accept any theory assuming that it is logically possible; regardless of how ridiculous or how offensive it is to our reason. The thought of a mud puddle evolving into a human being is utterly foolish; some how by adding millions of years to the fairytale - it becomes acceptable. Wake up, use your God given commonsense and reason! All kidding aside, if I were to believe in godless evolution; I would not have any problem believing that Mt. Rushmore was the product of wind and water erosion. In fact my logic would almost compel me to believe so if I were to juxtapose this with creation.